Václav Havel (IPA: [ˈvaːʦlaf ˈɦavɛl]) (October 5, 1936 - December 18, 2011) was a Czech writer, dramatist, and later a politician. He was one of the founding members of Charter 77, a loose coalition of intellectuals who opposed the totalitarian tendencies of the Soviet-backed Czechoslovakian government. The movement took its name from the title of a document initially circulated within Czechoslovakia in January 1977. Originally appearing as a manifesto in a West German newspaper and signed by 243 Czechoslovak citizens representing various occupations, political viewpoints, and religions, by the mid-1980s the document had been signed by 1,200 people. Motivated in part by the arrest of members of the psychedelic band Plastic People of the Universe, Charter 77 criticized the government for failing to implement human rights provisions of a number of documents it had signed, including the Czechoslovak Constitution, the Final Act of the 1975 Conference on Security and Cooperation in Europe (Basket III of the Helsinki Accords), and United Nations covenants on political, civil, economic, and cultural rights. Spurred on by his involvement with Charter 77, after the Velvet Revolution, Havel became the ninth and last president of Czechoslovakia and the first president of the Czech Republic. Havel grew up in a well-known entrepreneurial and intellectual family, which was closely linked to the cultural and political events in Czechoslovakia from the 1920s to the 1940s. Because of these links the Czech communist government did not allow Havel to study formally after he had completed his required schooling in 1951. In the first part of the 1950s, the young Havel entered into a four-year apprenticeship as a chemical laboratory assistant and simultaneously took evening classes to complete his secondary education (which he did in 1954). For political reasons he was not accepted into any post-secondary school with a humanities program; therefore, he opted to study at the Faculty of Economics of Czech Technical University. He left this program after two years. The intellectual tradition of his family compelled Václav Havel to pursue the humanitarian values of Czech culture, which were harshly suppressed in the 1950s. After military service (1957-1959) he worked as a stagehand in Prague (at the Theatre On the Balustrade, Divadlo Na zábradlí) and studied drama by correspondence at the Theater Faculty of the Academy of Performing Arts in Prague (DAMU). His first publicly performed full-length play, besides various vaudeville collaborations, was The Garden Party (1963). Presented in a season of Theater of the Absurd, at the Balustrade, it won him international acclaim. It was soon followed by Memorandum, one of his best known plays. In 1964, Havel married Olga Šplíchalová (Olga Havlová) to the despair of his mother. Following the suppression of the Prague Spring in 1968 he was banned from the theater and became more politically active. This culminated with the publication of the Charter 77 manifesto, written partially in response to the imprisonment of members of the Czech psychedelic band "Plastic People of the Universe." His political activities resulted in multiple stays in prison, the longest lasting four years. He was also subjected to constant government surveillance and harassment. After his long prison stay he wrote Largo Desolato, a play about a political writer who fears being sent back to prison. He was also famous for his essays, most particularly for his brilliant articulation of "Post-Totalitarianism" (see Power of the Powerless), a term used to describe the modern social and political order that enabled people to "live within a lie." Havel was a passionate supporter of nonviolent resistance. U.S. President Bill Clinton compared him to Mahatma Gandhi and Nelson Mandela. He became a leading figure in the Velvet Revolution of 1989, the bloodless end to communism in Czechoslovakia. On December 29, 1989, as leader of the Civic Forum, he became president by a unanimous vote of the Federal Assembly—an ironic turn of fate for a man who had long insisted that he was uninterested in politics. In this he joined many dissidents of the period, who argued that political change should happen through civic initiatives autonomous from the state, rather than through the state itself. In another move away from the ideals he put forth as a dissident, Havel presided over the privatization and marketization of the Czechoslovak economy even though he, like much of the Civic Forum, had previously spoken in support of what is sometimes called a "third way" toward neither Soviet-style socialism nor Western-style capitalism. Western powers, unsurprisingly, approved of this new state of affairs and put pressure on the government to make further changes in the direction of a market capitalist system. After the free elections of 1990 he retained the presidency. Despite increasing tensions, Havel strongly supported the retention of the federation of the Czechs and the Slovaks during the breakup of Czechoslovakia. On July 3, 1992, the federal parliament did not elect Havel—the only candidate for presidency—due to a lack of support from Slovak MPs. After the Slovaks issued their Declaration of Independence, he resigned as president on July 20. When the Czech Republic was created he stood for election as president there on January 26, 1993, and won. Following a legal dispute with his sister-in-law, Havel decided to sell his 50 percent stake in the Lucerna Palace on Wenceslas Square, a legendary dance-hall built by his grandfather Václav M. Havel. In a transaction mastered by Marián Čalfa, Havel sold the estate to Václav Junek, a former communist spy in France and leader of soon-to-be-bankrupt conglomerate Chemapol Group, who later openly admitted he bribed politicians of the Czech Social Democratic Party. In December 1996 the chain-smoking Havel was diagnosed as having lung cancer. The disease reappeared two years later. In 1997, less than a year after the death of his wife Olga, who was beloved almost as a saint by the Czech people, Havel remarried to actress Dagmar Veškrnová. That year he was the recipient of the Prix mondial Cino Del Duca. Havel was re-elected president in 1998 and underwent colostomy while on holiday in Innsbruck. Havel left office after his second term as Czech president ended on February 2, 2003; Václav Klaus, one of his greatest political opponents, was elected his successor on February 28, 2003. In November and December 2006, Havel spent eight weeks as an artist-in-residence at Columbia University. At the same time, Untitled Theater Company #61 hosted a Havel Festival, the first ever complete festival of his plays. The events came in conjunction with his 70th birthday. Havel was also a prominent figure in the fight against terrorism. In 2002, he was the third recipient of the Hanno R. Ellenbogen Citizenship Award presented by the Prague Society for International Cooperation. In 2003, he was awarded the International Gandhi Peace Prize by the government of India for his outstanding contribution towards world peace and upholding human rights in most difficult situations through Gandhian means; he received the US Presidential Medal of Freedom; and he was appointed as an honorary Companion of the Order of Canada. 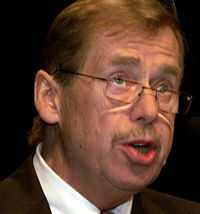 In January 2008, the Europe-based A Different View cited Havel to be one of the 15 Champions of World Democracy. Havel also received multiple honorary doctorates from various universities such as the prestigious Institut d'études politiques de Paris in 2009. Samuel Beckett's play Catastrophe is dedicated to him, as are Tom Stoppard's plays, Professional Foul (1977) and Rock 'n' Roll (2006). Havel died on December 18, 2011, aged 75, at his country home in Hrádeček, Czech Republic. His death was met with numerous tributes from world leaders as well as a three-day mourning period prior to a state funeral. The Václav Havel Tribute Concert was held in Prague's Palác Lucerna on December 23, 2011, the day of the funeral. Despite being initially uninterested in politics, Havel served as the last president of Czechoslovakia and the first president of the Czech Republic, playing a significant part in the breakup of Communist Eastern Europe. 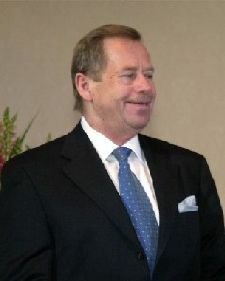 In an interview with Karel Hvížďala (included in To the Castle and Back), Havel expressed his feeling that it was his most important accomplishment as President to have contributed to the dissolution of the Warsaw Pact, which was officially dissolved at a meeting in Prague on July 1, 1991. He was a founding signatory on the 2008 Prague Declaration on European Conscience and Communism (also known as the Prague Declaration), which called for Europe-wide condemnation of, and education about, the crimes of communism. ↑ David Remnick, "Exit Havel: The King leaves the Castle," The New Yorker (February 10, 2003). Retrieved July 10, 2007. ↑ Paul Berman, “The Poet of Democracy and His Burdens,” New York Times Magazine (May 11, 1997); available online from Josef Schrabal's website. Retrieved July 10, 2007. ↑ Vaclav Havel: From "Bourgeois Reactionary" to President, Radio Prague. Retrieved July 10, 2007. ↑ Richard Allen Greene, “Vaclav Havel: End of an Era,” BBC News (October 9, 2003). Retrieved July 10, 2007. ↑ Havel at Columbia Retrieved March 9, 2012. ↑ Havel Festival, Celebrating the life and art of Václav Havel. Retrieved March 9, 2012. ↑ Vaclav Havel Acceptance Speech, National Constitution Center. Retrieved March 9, 2012. ↑ Honorary Doctorates. Retrieved December 23, 2008. ↑ Daniela Lazarová, Václav Havel to be given state funeral and highest military honors Český rozhlas December 20, 2011. Retrieved March 9, 2012. Capp, Walter H. Interpreting Václav Havel. Retrieved July 10, 2007. All links retrieved February 10, 2014. This page was last modified on 10 February 2014, at 16:18.